The European Commission is working on a proposal for the framework programme that will succeed Horizon 2020. This is done on the basis of various building blocks including the interim evaluation of Horizon 2020 and the Lab-Fab-App report (informally known as the Lamy report). We met Pascal Lamy, Chairman of the High Level Group on maximising the impact of European research and innovation programmes, and discussed some of the key findings of the Lab-Fab-App report and the group's vision and recommendations for the future. Last summer, the European Commissioner for Research, Science and Innovation, established a High Level Group to draw clear recommendations for the FP9 programme and prepare a vision for the future. H2020 is one of the world’s largest and most successful programmes of investment in scientific research as today more than 1.8 million researchers work in thousands of universities and research centres and industries around Europe. It is remarkable that with just 7% of the world’s population and 24% of global GDP, Europe produces around 30% of the world’s scientific publications! However, as research and innovation matter for our future the question raises how we could further maximize its impact. 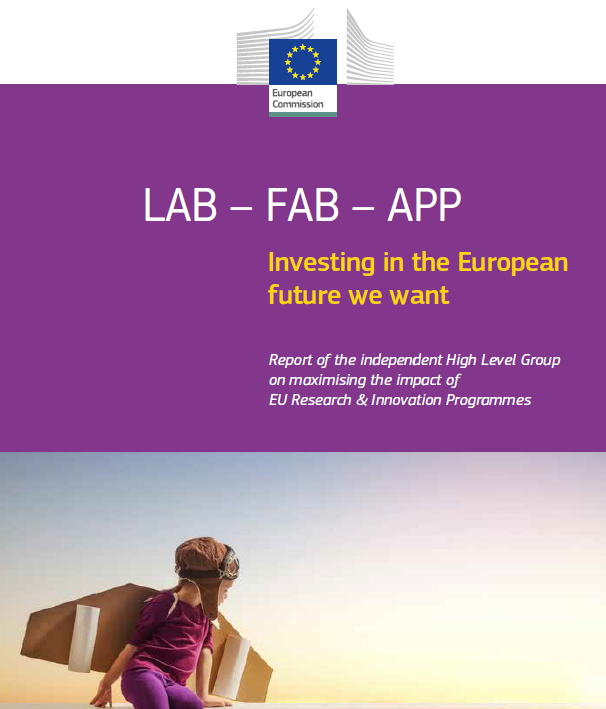 Following an intense 6-month period of consultation with various shareholders and the support of DG research for research, the group published the report “Lab-Fab-App”. It is based on data from the Horizon 2020 interim evaluation results, while Lamy acknowledges the great support from the European Commission directorate for Research & Innovation. “It was a very cooperative task and during this period I tried to take into account the opinions of all the members of the group. This was not so trivial as they were all coming from diverse backgrounds, but I felt that this diversity was also our strength and the chance to come up with some meaningful suggestions. The fact that we succeed to follow a consensus based approach in drafting the conclusions that you will read in the Lab-Fab-App report makes me really proud. Pascal Lamy has a long experience in negotiations that, coupled to his good understanding of how EU functions, made him the ideal choice to chair this group. From 1985 to 1994, he was Chief of staff to the president of EC, Jacques Delors. Between 1999 and 2004, he was appointed Commissioner for Trade of EC under Romano Prodi, and from 2005 to 2013 he served as DG of the World Trade Organization. “I had a long acquaintance with this programme from my previous positions in EC and I always insisted that the EU should invest more of its resources in research and development. I believe that research and development has a strong additional value stemming not only from the new knowledge that is produced but also from the cross-fertilization between different fields and through global collaboration. Investing only a 10% of the total budget always seemed a very small figure to me”. The first key message of the Lab-Fab-App report is the urgent need to invest more in scientific research to tackle the present societal challenges. The demographic problem that Europe faces, the increasing social inequalities and the challenges posed by emerging economies call for more investment in open science that can trigger faster and fairer growth to address these problems. “To overcome the big societal objectives that today matter across Europe we need to invest in a future based on innovation across all members of the Union”, and he adds “this is why we have suggested increasing the available funds under FP9 from the current H2020 77EUR billion budget to 160EUR billion on a seven year basis”. Investing in research and innovation is increasingly crucial for shaping a better European future in a globalising world, where success depends ever more on the new knowledge. Innovation can help address some of the most pressing questions while it also opens new markets that can boost European competitiveness. Today, EU trails well behind many of its trading partners when it comes to innovation. There is an abundance of unexploited ideas and research results with considerable innovation potential, which are not being brought to the markets. “Though Europe invests largely in research and there are many bright minds it still lack behind in innovation compared to other countries including the US, Japan, China and South Korea. We need to pay more attention to the gap we have in Europe between what we produce in science and what we produce in innovation including new products and services”. The need to address this obstacle in FP9 is more urgent: “This is not new; we have known this for decades. But the rate of technological and economic change and the urgency of global challenges continue to outpace Europe’s response and reforms. This is why we advocate for larger investment in research and innovation while at the same time we try to build stronger industry participation in FP9”. Lamy notes that “EU private intensity to invest in research is smaller compared to other places outside Europe. I believe that we need to do more in this area and specifically to the innovation that presently seems to be left only to small enterprises and startups. In my view we should think how to scale up these businesses and explore new tools to ease their access to funding”, though he adds “it is a complex ecosystem with complicated dynamics and thus there is no simple solution”. Another innovation of FP9 compared to its predecessors is the concept of R&I missions that should foremost be easy to communicate and capture public imagination and involvement. “Missions should mobilise many actors and investors, including at national level, and induce action across disciplines, sectors and institutional silos”. The report stresses that public financing of science necessitates more public debate and setting research and innovation missions can inspire European citizens to get more involved. “Given the evolution of science that touches borders that are philosophically, ethically or politically sensitive we need to grow more support and build more legitimacy that will also allow to further increase the public investment in science. This means that we need more public debates about the impact of science in people’s daily lives and the types of research that can guarantee a better future. Of course we understand that this concept may be received with some scepticism from scientists or researchers and this is why we have launched a public consultation where everyone is welcome to contribute”. Another step-change envisioned in the Lab-Fab-App report is to open the EU R&I programme non-EU countries based on the level of excellence in R&I. This will make the EU programme the potential nucleus of a global programme for open science and open innovation, exporting good regulatory practices and improving international trading and investment conditions. It will be an expression of the EU’s ambition to harness globalisation through collaboration in science and innovation, thus helping to address the negative aspects of globalisation that we see today. Finally, the group makes an important link between the much-needed increased commitment to research and a more efficient use of resources through a simplified programme, with fewer funding schemes and provisions flexible enough to accommodate the diversity of beneficiaries’ interests and backgrounds. Following the publication of the Lab-Fab-App report there will be a wider public debate on what to do with the next framework programme. After all investing in research and boosting innovation is a complicated issue and has a certain political nature. Lamy says: “The value of this report is whether it becomes an element of political debate with politicians, researchers and the broader society. It should ignite some discussions about the level of investment needed for science and innovation and where do we want to go as a union. This is why we opted for a rather intriguing name while we tried to produce a short report that will possibly reach a wider audience including many non-experts”. The next months will be crucial for negotiations that will help taking a decision about the FP9 programme, just in time to prepare everything by the end of 2020 when the new framework will take place. “We have shared our results with many European institutions, national governments and other stakeholders including universities, research institutes, non-governmental organisations and industries”. Lamy explains: “Given that the next budget cycle will take place under very specific conditions, that include a gap of about 10 billion caused by Brexit, that necessitate some reshuffling. This opens space for action and if we want EU to grow I think that we should seriously consider the importance of investing more in science and innovation. To leverage the knowledge capacity that we have built in Europe we need bring in the table more resources and help people exploit their ideas and their potential”. Europe is left with clear yet challenging choices. “The EC should adopt long-term thinking which is needed to understand the impact of research which is different than other parts of European policy. When it comes to research, politicians often can’t show immediate tangible results in their countries. It requires long-term commitment and is more abstract so it needs strong public support”. We need to face up collectively to the immediate challenge of the recovery and to long-term challenges – globalisation, pressure on resources, ageing – so as to make up for the recent losses, regain competitiveness, boost productivity and put the EU on an upward path of prosperity.